The Ninth Concepts Inc. is the authorized distributor for the Aura Video System (AVS) in Asia for Inneractive Inc. California, USA. The ground breaking state-of-the- art technology will truly amaze you with its 'live' and colourful images of aura and your chakra system. Find out more about this awesome energy technology by reading the information below. Be sure to watch the informative videos for greater insight of the AVS. What does THE AURA CAMERA SCANNING DEVICE REVEAL? Your base glows a vibrant orange, reflecting your foundation of confidence and courage. Yet the core of your aura radiates green – you are a natural healer and very sociable! Others seem to sense your optimism and intellect, judging by the warm yellow in the right field of your aura. 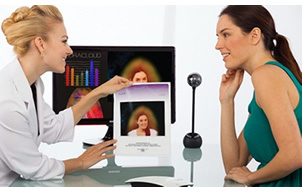 Innovative aura imaging technology visualizes and validates the essence of human energy. We integrate scientific data with the latest technology to provide illustrated insight beyond the basic understanding of the physical body. 1 Biofeedback Reading – A biosensor measures skin temperature and electro-dermal activity (electrical energy) as biofeedback data. 2 Displays on Screen – Our biofeedback software displays data as 3D full-body aura images, detailed graphs and charts, or captures an aura snapshot photo. 3 Data Translated – Each aura image is a personal representation of the individual’s bio-energetic field and unique life-data. It portrays their emotional energy, personality type, and overall wellness statistics. Dr. Valerie Hunt, a leading researcher at the University of California in Los Angeles, conducted studies using sophisticated sensors to record subjects’ biofeedback data while clairvoyant healers described their aura. She discovered that bio-data frequencies and patterns were indicative of aura colors. AVS’s energy technology uses this same technique combined with biofeedback data graphs and reports to measure a person’s emotional-energetic state.